It's May 10th, and asparagus season is nearly over here in Southern California. While the majority of the country enjoys asparagus from April to June, our season usually stretches from late February to early May. I'm not sad though -- this season's asparagus has been superb. The smooth, svelte green stalks with delicate purple tinged tips have had a mildly earthy flavor and deliciously tender texture. Since I've been buying two bunches of asparagus nearly every week for the last two months, I've learned a few things, So here are some tips on how to select, store, and cook with asparagus. How to select asparagus: What's better, thin or thick stalks of asparagus? Both. No, that's not a typo. Every spring there is an endless debate over which is better, thin or thick stalks. Most people swear thick asparagus stalks are tough. I disagree. I have eaten many tender and flavorful thick stalks of asparagus. What' really important is the quality of the stalk: look for straight, firm green stalks with light purple tinged tips. Look at the bottoms of the stalks. If they're white, dry, and woody, then they're probably old. Also avoid shriveled, overly dry, or pitted stalks. 1. Trim the bottoms of the stalks and stand them upright in an inch or two of cold water in the refrigerator; loosely cover the stalks with a plastic bag. Asparagus should last 3-4 days, unless it's fresh from the farmers' market, in which case, it could last up to 6 days. 2. 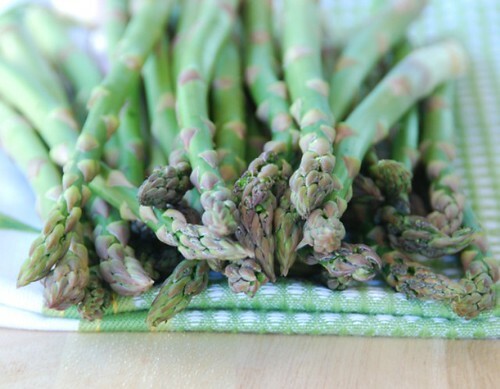 Wrap the bunch of asparagus with a damp paper towel and place in the vegetable bin for 3-4 days. 3. Par-boil the stalks for 1 1/2-2 minutes, then plunge in a bowl of ice water for 2-3 minutes. Drain, pat dry, and store in an air-tight container in the refrigerator for up to 5 days. How do you trim asparagus? Does the famous snapping of the stalk work? Yeah, it does. Hold the asparagus stalk with two hands and bend it. You'll feel a natural pull toward the bottom third of the stalk, where it feel like it wants to snap. Give it a quick snap, and the bottom will pop right off. If the stalks are really tender, this part isn't even necessary. Alternatively, you can use a vegetable peeler and shave off the thick, woody parts on the bottom. Very lightly. Nothing ruins asparagus more than overcooking it. You can boil, steam, roast, bake, grill, saute, or nuke it. You decide. Just keep it al dente, so it still has some crispness when you bite into it. What are the health benefits of eating asparagus? Asparagus is rich in vitamins A, C, and K as well as folate and dietary fiber. It's also low in calories and is a natural diuretic. What can you do with asparagus? A lot. In addition to making a great side dish to meats and seafood, try asparagus in soups, salads, egg dishes, pastas, risottos, and stir-fries. For an elegant yet easy appetizer, wrap asparagus with prosciutto; drizzle with extra virgin olive oil and broil for 1-2 minutes; serve on rounds of toasted Italian bread. Asparagus is delicious on sandwiches and makes a unique pizza topping, especially when paired with caramelized onions, sauteed mushrooms, and smoky Gouda cheese. Here are two of my favorite ways to eat asparagus. Both recipes are deliciously easy to make and simply delicious. They pair well with everything from chicken and pork to seafood and tofu. In a small bowl whisk all ingredients from lemon juice through black pepper. Set aside. In a large skillet over medium-high heat, warm 1 tablespoon olive oil. Add asparagus stalks. Saute for 5 minutes, or until just tender. Alternatively, bring a large pot of water to a boil. Add asparagus stalks, and boil for 2 minutes. Drain and set aside. Pour juice mixture over cooked asparagus, and cook until just heated through. 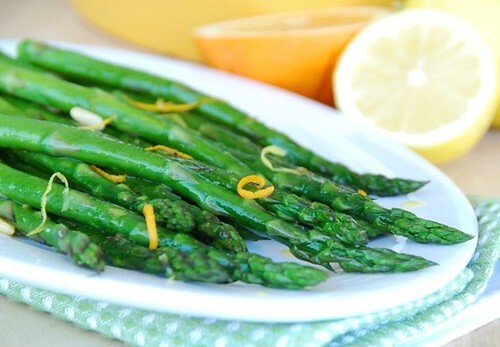 Place asparagus on a serving platter, and drizzle with remaining juice. Sprinkle with toasted pine nuts, if using, and garnish with orange and lemon zest curls. Lay asparagus stalks in a straight line across the middle of the sheet. Drizzle with olive oil, season with salt and pepper, and using your hands, gently turn the asparagus until well coated. Roast for 12-15 minutes, or until just tender. Top with bread crumbs and cheese; cook 1-2 minutes, or until just golden brown. Serve immediately. I've been ga-ga over asparagus lately. I love omelets with asparagus, grape tomato and goat cheese, asparagus grilled, roasted and steamed too. The woody ends of asparagus stalks that you bust off are awesome as garden compost; they make beneficial nematodes when they break down so toss 'em on your flower beds! What beautiful photos of my favorite stalks! If I had to choose one vegetable to live on, it would be asparagus. 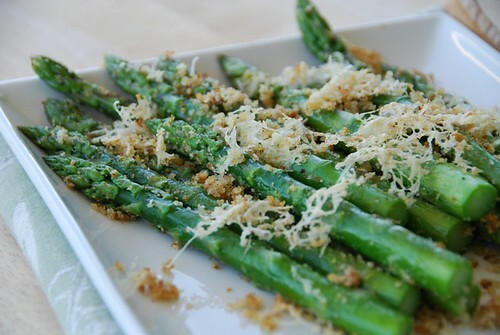 Your recipe for roasted asparagus with parmesan sounds excellent! I LOVE asparagus! I normally grilled them. Loved the parmesan and bread crumbs recipe, thanks for sharing! Thanks for the info and useful tips! Both dishes look fantastic! This is an ingredient I use all the time but I've never really looked into the details of handling it properly. Thanks for putting such an informative post together! Thanks for all the asparagus "tips!" (Er, did the pun work? :) I love the thick ones-- too bad they're a little harder to find here! I love love love asparagus! In NE Ohio, it is the harbinger of spring. I just built an asparagus bed next to my strawberries and rhubarb. In the next few years, I will be able to harvest it here! Excellent post, Susan! Just FYI, after experimenting with -- um maybe 20-something? ways to cook asparagus, I've learned that fat asparagus are best for roasting, thin ones for steaming. The other big question is whether to peel or not: I don't always, it's not always necessary, but when I do, those asparagus are always particularly unctuous. I absolute LOVE asparagus. I often make it with a lemon vinaigrette but this extra citrus flavor sounds even better. I'll have to give it a try. I was at the grocery store the other day and saw some purple asparagus next to the white and green types. Have you ever cooked with purple asparagus before? I've never had it, but I'm kind of curious as to what it tastes like and if there's any real difference between the green and purple kinds. Thanks for the informative post! Lots of useful information, Susan! We are right in the middle of our season, here in Michigan. Eating it every day now! The first time I had roasted asparagus, my life was forever changed. For what it's worth, I store asparagus standing up in an inch of water, and it lasts a LONG time that way. I know I've had it in my fridge for more than a week and it hasn't suffered greatly for it. It just has to stay in contact with that water. Thanks for the informative post, Susan. I am enjoying asparagus season as long as it lasts. Have a great week! This is great info. I have asparagus in the frige now. I was thinking of cooking a crème of asparagus. What I didn't see was how to CLEAN asparagus. The local produce I buy is extremely sandy. Even after peeling, there was sand in the tips. What to do?? I am putting the roasted asparagus recipe aside to make this weekend when my in-laws are in town. What a great recipe! great post! my favorite way to do asparagus is in a little mirin, but i'm definitely gonna try them with breadcrumbs and parmesan. I heard on the market report for Good Food on KCRW that the fat stalks were from young plants and the thin ones were from older plants. This was from a grower that should know...It certainly changed my mind about thick and thin. I did notice that there was a lighter crisper snap to the fat young stalks and have therefore consumed more of that variety this spring. Thanks for the post. Great tips. I love asparagus. Like you say - easy does it is the watchword with asparagus. With really fresh, young asparagus, I like to have it as simply as it comes - lightly steamed, with lots of butter and black pepper. It really is one of the great joys of the early summer. Asparagus season is just starting out here in New York so your post couldn't have come at a more perfect time! I adore asparagus with citrus, but also have been known to drizzle a good syrupy balsamic vinegar over roasted spears. Delicious! I recently had, and then mimicked, a great salad at Incanto here in SF: Jumbo-thick asparagus and radishes, both shaved into ribbons with a peeler, along with baby arugula and pecorino, all very lightly dressed. A revelation! I also love the thin stalks tossed with oil and roasted, simply. kate-garden compost --what a great idea! tw-It's my personal favorite way to eat asparagus. rosa-I'm glad you like it. jude-Glad to be of assistance then. debra-Ah, in between two of my other springtime delights. alanna-Thanks, Alanna. I appreciate it. italiandish-That's what I like to hear. simona-And it's beautiful while it lasts. anonymous-That's because it's always so clean! I would submerge it in a bowl of cool water, then drain it and rinse if necessary. Don't do it until you're ready to cook it though; otherwise it will turn moldy or mushy in the fridge. Heather-Mmm, I've gotta try the mirin now. sabina-Thanks for sharing the insider info! I'll have to ask next time I'm at the farmers' market now too. afos-There is something so wonderful about fresh cracked black pepper on asparagus. laura-I'm so happy to hear that. Thanks. Great informative post as I love asparagus! The asparagus season has finally arrived in Estonia, too, and I've enjoyed quite a few good green asparagus dishes already. Going to make asparagus risotto tonight, I think. And of course - thank you for an informative post, Susan!